Foodie Friday has turned into one of All The Single Girlfriends’ most popular series. It’s one of my favorites too. During the past year our Gf Authors have opened their recipe boxes to share family treasures and opened their hearts to share foodie memories. We can dish and dish it up with the best! We ♥ to eat healthy but only if it’s delish like Kelley Conner’s veggie chili. But Girlfriends, we ♥ our desserts! Check out Marianne Richmond’s Chocolate Chip Pecan Pie so yum! Rebecca Crichton’s posts are often a trip into the exotic .. like how she celebrates the holidays by combining Chinese garlands, a Greek main dish, Easter European latkes and lots of love and laughter. Speaking of recipes from afar .. New Zealander Jilly Martin’s authentic Pavola is a not to miss one! And closer to home Jody DeVere lets us in on her mom’s potato salad recipe that is a family July Fourth tradition. Foodie Friday is not just about recipes. There were memories like Tani Wolf’s post Daddy’s Tomato Garden that includes a special tomato recipe and my The Singing Soup Bowl story. What’s a Girls Night Out without a tini or two?! Mary Schmidt gave us more fun and laughs with her White Trash Toonis recipe. No need to feel sad you didn’t get a royal wedding invitation when Polli Graham found the recipe for Prince William’s groom cake. Add Mary’s toonis, your best girlfriends and create your own royal party! Jacki Schklar helped us get creative with our food budgets with hints on how to shop healthy and smart. We like to dish in the kitchen but we also like to step out and we love sharing our “finds” with you. Dorothea Bozicolona Volpe reviews a “killer burger” joint in Hotlanta. Sometimes our pets were the focus of Foodie Friday with recipes for yummy treats for our pooches from Serena Kovalosky. Other times we took a more serious approach like when Bonnie Simons wrote about local food and what she learned from selling muffins. Or when Debra Pearlman bravely told us how she changed her holiday traditions in order to prepare for bariatric surgery. With hours away from bidding 2011 either a fond good bye or a kick in the derriere I wondered what what food our Girlfriends make special for New Years or New Year’s Eve? For me, NYE meant lobsters and champagne with close friends. Then it changed to a night of total decant junk food, games, movies and adult beverages. Who knows what’s next! 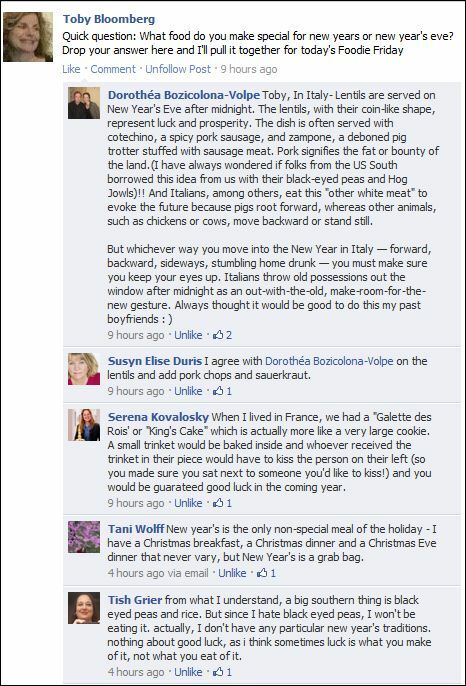 Here’s what our Gf Authors and special guest Sarah Bernart do or don’t do for foodie New Years Eve and New Year’s Day. What’s your foodie New Years Eve or New Year’s Day foodie traditions .. or not!? i want the recipe for that yummy-looking drink in the photo! Frozen Pomegranate Margarita from Rosa Mexicano at Atlantic Station in Atlanta. 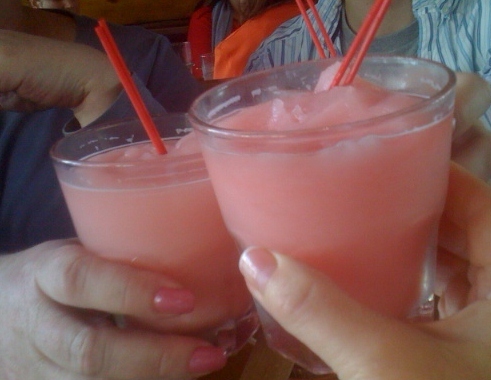 Polli is on the left and I’m holding the glass on the right. It was so delish .. and we figured the pomegranate made it a healthy drink .. sort of! Love this part of All the Single Girlfriends. I’m feeling very ‘foodie’ of late. Is it my age? Am I more appreciative of food now? Not sure, but I sure love learning new recipes and thinking about my health and my eating habits, of late. I don’t know about the age thing Yvonne but it’s certainly a fun way to connect with friends!